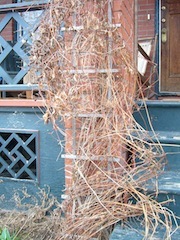 Usually the approach of Easter has me itching to get outside to tidy up the winterʼs debris. 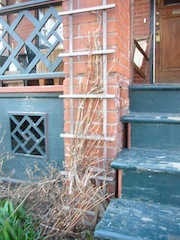 This year, however, the wintery weather kept me out of the garden until mid-April. 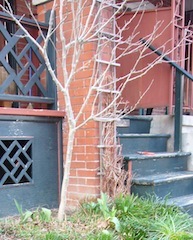 It was the sight of my valiant spring bulb foliage struggling to elbow itʼs way through the litter of dead leaves and last yearʼs flower stems that finally urged me into action. 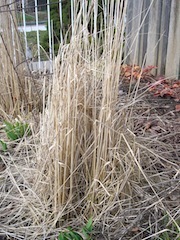 My first priority was cutting back my ornamental grasses; the Feather Reed Grass Calamagrostis acutifloria is among the first grasses to break dormancy, so I wanted to cut back last yearʼs dead top growth before the new shoots emerged, so I wouldnʼt be cutting the tips of new blades along with last yearʼs leaves. Luckily I was just in time, as the first hints of green were peeping through. 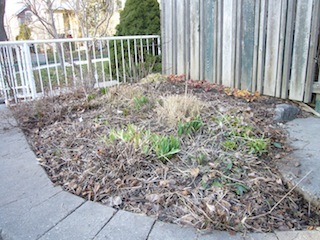 While I was at it I trimmed away all the mess of Catmint Nepeta stems and other dead foliage that was obscuring the new iris leaves and tiny shoots of other perennials. 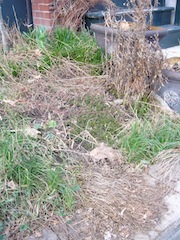 At this point I wasnʼt stripping the bed of all the loose litter, since we could still have freezing nights and even snow, but even removing the most visible clutter made the green pop. 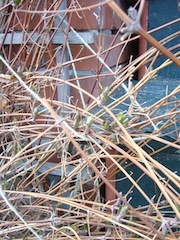 Next I tackled pruning my Nelly Moser Clematis, which was already starting to send out new shoots well up the stems. Better later than never though, as it grows vigorously and would become totally unmanageable if left to leaf out from top to bottom of last yearʼs growth. 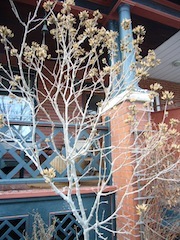 While I was at it, I trimmed all last yearʼs seeds heads from the Rose of Sharon Hibiscus syriacus. 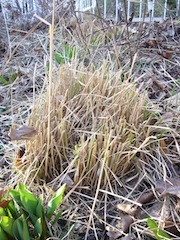 Iʼm going to kick myself all summer for not getting rid of them last fall, as I pick the volunteer seedlings from the bed below, but at least the fresh spring foliage wonʼt be competing with the brown seedhead clusters. 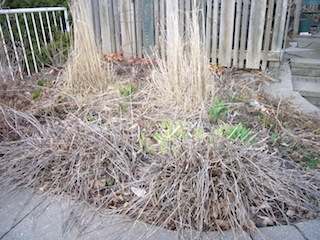 I have a fair number of late-blooming perennials that I am loath to cut back in the fall while they are still providing some interest in the garden, so spring usually means removing lots of lanky stems that sprawl over the new growth. 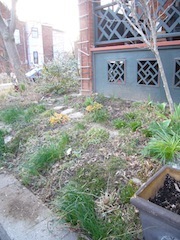 Looking at this dreary mess itʼs hard to remember how lovely it looked last summer, but trimming it away makes it suddenly seems like spring! 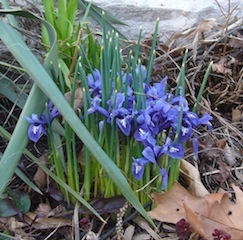 And hereʼs my reward: this little dwarf Iris clump that was all but invisible before.